Allison Hilliker ('05) doesn't consider blindness such a terrible thing. "I've dealt with it more or less my entire life. I never really had much of a choice; you either live with it or you don't," Hilliker said. And Hilliker has definitely chosen the former; she lives. Born in Shelby Township, Michigan, Hilliker was born with glaucoma and has been blind in some form all of her life. "There are a lot of different levels of blindness. When I started out in school, I could read, but I had to read large print. I used a magnifier to read and dark pens and markers to write. But around third grade it got really difficult because the print got smaller, and there was more of it," Hilliker said. "I got frustrated because I could understand the reading material, but I could only read very slowly and with tremendous eye strain." By the time she was in the fifth and sixth grade, Hilliker needed to be taught Braille, which meant going through the difficult process of re-learning how to read. Since she was attending regular schools, the county provided Hilliker with special teachers that taught her Braille and other kinds of blindness skills. "I had the benefit of being in a regular class all my life. It was useful because I had the same standards, and I learned the same stuff," Hilliker said. "But, because I was in regular schools all my life, I didn't get good blindness skills training. So when I graduated, I had a high GPA and a good ACT score, but I didn't have the blindness skills." Hilliker decided to postpone going to college for a year and attend the Louisiana Center for the Blind. "Lots of times the teachers working in the field of blindness have very low expectations because they think that blindness is really terrible, like a tragedy. They are sighted, and they think that, if you can't see, you can't do much. But most of the staff and instructors at the Louisiana Center were blind," Hilliker said. "It was such a confidence-builder to see people who do what you're learning everyday and who are professional and successful and have such good attitudes." Hilliker spent eight months in Louisiana improving her Braille reading; becoming a better cane traveler; and learning to cook, clean, do laundry, grocery shop, and other similar skills. After applying to five schools and being accepted at all five, Hilliker decided to come to Hope for the typical reasons. "Hope, because of its size, doesn't have an awful lot of services for disabled students. They have them, but they are very small. I don't mind that, though, because they are there when I need them, and they don't interfere with my life," Hilliker said. "At big schools the services are very custodial. They will schedule your classes for you, buy your books for you, and make all of your decisions for you." The only accommodation that she has at all is that Hope allows Hilliker to sign up for classes early because she needs to order her books early in order to have them in time for the start of classes. Because Braille is hard to come by, Hilliker tries to buy most of her books on tape. If she can't do that, then she can do one of two things. "I can scan the book, and there is software that I can use to convert text to spoken word. And if that doesn't work, I can hire readers," Hilliker said. "I also use a Braille notetaker to take notes. It's like a little laptop, and I can make files and folders and then put them onto a disk and insert them into my computer. There is a special printer in the library too called a Braille embosser, which prints in Braille." While at Hope Hilliker will become certified to teach elementary education. She then plans to receive her master's degree to teach blind children, a particular passion of hers. Throughout her life Hilliker has been very involved in the National Federation of the Blind (NFB), the nation's largest organization of blind people. She is a national board member of the NFB's student division, founded the Michigan Association of Blind Students, a student organization under the NFB, and is currently president. "The NFB, which has state and local chapters as well, works nationally on the legislative front and focuses on advocacy, developing technology, and forming support groups," Hilliker said. "For instance, if a student wants a degree in biology and their school says `No way. You're blind,' we will try to help them." Hilliker's organization also offers support and networking like sharing resources. Hilliker will be speaking at a national student conference held in February. "It's one of the things I'm most proud of. It's one of my greatest accomplishments," Hilliker said. For the most part Hilliker is happy at Hope. She's become involved in a small group Bible study, the Women's Issues Organization, and the Opus editorial board. Still life can be difficult. "It's hard because most people don't know anything about blind people. They can't imagine how I function, but they know I do because they see me. However, they don't know how to approach me. I figure that, if I'm comfortable with blindness, then other people will be too, but that only works to some extent," Hilliker said. "I don't consider myself particularly amazing. At first I thought, 'Oh great. They are interviewing me because I'm the amazing blind girl.' I take it for the compliment it is, but I try not to see myself that way. Most of the stuff I do is regular, everyday stuff. I would rather be known for something I did." 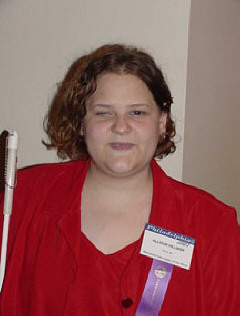 Hilliker treats her blindness like a characteristic or trait. "I like to think of myself as a person first and then blind second. I'm blind, but I also have curly hair, and I like talking on the phone. It�s a piece that's part of me as a person," Hilliker said. "I think everything we do and everything we deal with makes us stronger. Everyone has their own challenges that they deal with in life, and, even though mine may seem bigger and more difficult, I've learned that it really is not." I wanted to write and share a small experience of mine with you. I think that you all may be able to appreciate it and understand why I thought it was so important. Here it is. Here at school I am studying elementary education. With my first education class, educational psychology, I have what is known as a field placement. This means that I get to be in an actual classroom at least once a week. I have second grade, and it's gone well so far. The teacher and all of the students are sighted, so I have to do a great deal of proving myself as a competent blind person, capable of working in a classroom. Every day is an adventure, but so far things have been going well. The kids see me as a teacher-like person, and the classroom teacher has been giving me ever-increasing levels of responsibility. Basically we've all been able to learn a great deal from one another. Last Thursday, however, was a day that tested everything I had in the way of philosophy and confidence. That was the day that we all went sledding. Now this really hadn't been something I had planned for, but when the situation arose, I had to find a way of dealing with it. I usually go to the class in the mornings, but this week saw me having an afternoon visit. The classroom teacher forgot that I was coming that day, and that afternoon turned out to be a special sledding time for the kids. When I walked in to the class, the teacher said something to the effect of, "Oh no, I forgot that you were coming; we're sledding today. Can you do that?" Those really were not the words I had been expecting to hear, but I just smiled and said, "Certainly, I can sled, not a problem." I was really thinking, "Oh boy, here goes!" Now, having grown up in the Midwest, I have been sledding a number of times throughout my life. I knew that it was something I could do well enough as a blind person, but I also realized that the others didn't necessarily know this. I was fully aware of the possible problems associated with sledding with twenty-some kids. I was fairly certain that most of them and their teacher did not believe that sledding was something I could do safely. Sure enough, without asking me about what I thought, the teacher announced to the class that, before heading outside, they would all sit in a circle while I explained to them how best to do things for me while we were sledding. I wanted to tell her that there really wasn't anything specific that anyone need do, but she had already made the announcement to the class, and I didn't want to make it a bigger issue than it already was. So we gathered around, and I took the chance to re-explain my cane and what it does. I also reassured them, more for the teacher's benefit than the kids', that I could do a lot by sound and that I would hear an approaching sled and move out of the way if I had to. I tried to make everything seem as normal and as easy as possible. The kids were fine with this, so we headed out. Again without asking me first, the teacher next tried to assign one of the kids to sort of guide me around outside. I was getting a bit frustrated by this point, but I knew that I could not let it show. I instead politely explained to both the child and the teacher that a guide wouldn't be necessary. I would be able to manage. The explanation seemed to suffice, and I headed towards the hill, using my cane and following the sounds of talking and laughing children. Well, the hill on the playground was pretty chaotic, even if it was only the one class out at that time. All I can say is, "Thank goodness for the blindness skills I've obtained." Otherwise I would likely never have managed. There were kids, sleds, snow, and ice everywhere. Sighted or blind, the hill was crazy and alive with child activity. I can't say that everything went absolutely perfectly, but when it was all said and done, I thought it had gone rather well. After a few times of people being hesitant to have me climb the hill by myself, they got used to it. I sledded down that hill with the kids, and things went all right. I managed to dodge sleds fairly well, and I never once ran over a child. The teacher was sledding too, by the way, so my sledding with the kids was not at all odd. The best part of the experience was when a couple of the girls in the class even begged me to race down the hill with them. This was something that made me feel normal and accepted. When it was all over, I was tired, cold, and sore, but happy that things had gone well. Not one person offered to guide me on the way back into the school, so I concluded that I had done some educating. I helped the kids gather their sleds, and we walked into the school together. I like to think that everyone, kids and teacher, learned a little bit on that afternoon. I don't know, but I for one was pretty happy with the way things worked out. The day's sledding adventure seems like a small thing in many ways, but we as blind people know that it wasn't at all small. It felt as if it was an accomplishment of sorts. As a blind student I often get tired of having to prove myself to people all the time, but on days like these, when it seems to work, when I actually see the difference, it's worthwhile. When we are challenged to do things that we are uncertain about, when our philosophy must be put into practice, and when, like today, we are able to educate even a small group of people while doing so, then it's a small victory for us all. I'm sure that many of you have experiences similar to this, but this one was special to me, so I thought that I would share it with you on the list.